Pipeshark serves the eastern Pennsylvania area and is extremely experienced in all phases of trenchless sewer repair. We are fully trained and certified to safely perform trenchless sewer line repair services and keep homes and businesses across Pennsylvania intact throughout our visit. The trenchless sewer repair processes which we are skilled in performing do not require the digging up and removal of old pipes. Landscaping is not destroyed, and huge machinery and a long work schedule are not required for us to complete our work. Trenchless sewer repairs involve leaving the old pipeline where it lies and performing repairs or replacement from that underground location. Trenchless sewer line repairs in residences, municipalities, and commercial industries all begin diagnosis. We use our state-of-the-art, robotic sewer cameras to inspect the troubled line from the inside. Our technician on the surface is able to control the movement of the camera and view the resulting video feedback. This process enables us to go right to the source of the problem. We are able to evaluate the cause and determine the best solution. Pipe bursting is a replacement method employed when the damage in the pipeline is too extensive for relining services to be effective. Pipe bursting utilizes a new incoming pipe, a pipe bursting head attachment, and a chain and pulley system. The chain is fed through the old pipe and attached to the pipe bursting head. The pipe bursting head is then attached to the end of the incoming pipe. As the incoming pipe is pulled directly into the old pipeline, the original pipe is split into fragments, which are pushed into the surrounding soil. The new pipe replaces the old, using the original tunnel underground. 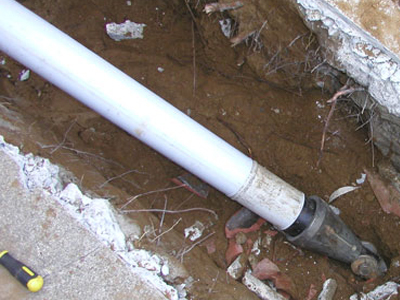 Cured-in-place pipe lining is a trenchless repair method. When cracks under a certain size are located, the pipe can be resurfaced from the inside using a pipe liner. Before the pipe liner is applied or if the sewer camera inspection located a clog within the pipeline, the pipeline interior wall is scoured clean using our hydro jetting equipment. Once the interior of the pipeline is cleaned, the CIPP liner can be inserted. The liner is treated with an epoxy resin. Once the liner is drawn into the pipe to the correct location it is inflated, pressing the resin against the interior wall of the pipe. The resin is held firmly against the pipe wall for a number of hours, until it has cured and hardened into a new interior pipe wall. Our Pipeshark team is extremely experienced with Trenchless sewer repair and offers these services for maintenance, pre-purchase information, and troubled pipeline diagnosis in houses, condos, and apartment complexes across Pennsylvania. Our experience also extends to working on projects with engineers, municipalities, and governmental agencies while maintaining the standard code and regulations. Call our staff of experts to schedule a consultation and learn more about how we can help you. Pipeshark serves the Harrisburg, Hershey, Lower Merion, Lancaster, Devon, Paoli, West Chester, Berwyn, and Wayne, Pennsylvania areas. We have also traveled as far as Washington D.C. to support specialty project teams.